Find peace within the chaos. 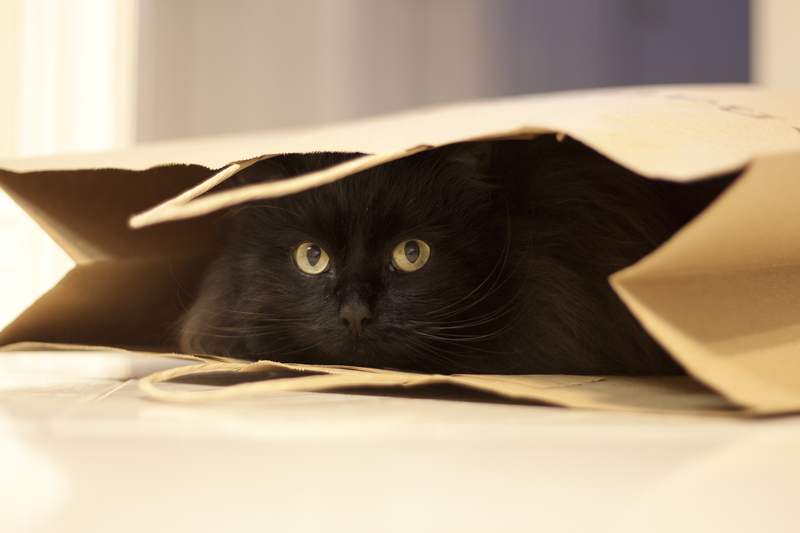 Black cat hiding in paper shopping bag with green eyes and whiskers peeking out. The Roman Emperor Antoninus died in 161 and Marcus Aurelius and Lucius Verus assumed the roles of co-emperors. But, Aurelius’ rule was a challenging period for the Roman Empire. He spent the first years of his reign fighting the Roman–Parthian War of 161–166. During this war, the Empire suffered great difficulties and losses but eventually re-occupied Edessa in Greece where the deposed king was returned to the throne. However, the returning soldiers brought back with them a plague that would torment much of Europe for years, killing around five million people. Later, from 166 to the end of Aurelius reign in 180, the Empire fought the Marcomannic Wars, where Germanic tribes continuously invaded Roman territory across the northern frontier regions. The Roman army, after a long struggle, managed to push back the invaders and re-establish the frontiers of the Empire. Marcus Aurelius acquired the reputation of a philosopher king within his lifetime, and the title would remain his after death. He was a practitioner ofStoicism, and his personal philosophical writings, which later came to be called Meditations, are a significant source of the modern understanding ofancient Stoic philosophy. Marcus Aurelius wrote the majority of the twelve books of the Meditations at Sirmium (modern day Serbia), where he spent time planning military campaigns and strategy during the Marcomannic Wars. A few of the books were written while he was positioned at Aquincum on campaign in Pannonia. And, the internal notes tell us that the first book was written when he was campaigning against the Quadi on the river Granova (modern-day Hron in Slovakia). “Meditations” served as Aurelius’ journal, a private source of his own guidance and wisdom during times of darkness. His words are simple and honest, and the sentences are delivered like entries in a diary; the pages seem to be a list of quotations, all varying in length from one sentence to long paragraphs. It is unlikely that Marcus Aurelius ever thought someone would publish these writings. He simply wished to record what he believed to be true. But, when reading Meditations, we do not get the sense that the author was, at the time, the most powerful man on the continent. The vulnerability of Aurelius’ words falls onto one’s heart, and you feel yourself empathising not with the vast fears of a Roman Emperor, where war and power are all that must occupy the mind, but, instead, with the melancholy struggles of a rather lonely man. For Aurelius was a man with no equals, a man who had all the wealth and beauty in the known world, yet no one to share it with. So sad are his words that the reader imagines the author to be a fragile being with the same worries and doubts as ourselves, rather than a head of state with a breast plate and a red cloak. The journal was an attempt to counsel himself through his own darkness. The reader feels comfortable and calm with his words; we cannot help discover ourselves in each of his little splashes of wisdom. But, I suppose this is the nature of the diary. For diaries are intimate and individual, they allow the author to open their hearts and express their deepest passions. And, by expressing our own unique message, the lyrics of our hearts, we touch upon a universal truth that speaks to everyone. Here lies the beauty of Meditations and the reason why it has been a major source of guidance to a great many people for almost two thousand years. He was correct. Power does tend to corrupt the individual, but only because power exposes the true nature of the ruler, not because it turns the ruler sour. Marcus Aurelius is, perhaps, the exception to this law in Western history. He was the only ruler that somewhat resembled Plato’s idea of the philosopher king — he was the last Good Emperor. This is easy to see when reading his journal. The central theme to Meditations is that if one wishes to keep a tranquil soul, then he should live according to nature. This is the underlining idea of almost every sentence he wrote in Meditations. Clearly, he tried hard to remind himself of this wisdom lest he become a tyrant just as those who came before and after him did. The temptation to control and handle every movement of the European continent must have been overwhelming. Because, as an emperor, Aurelius had to stand firm against the weight of a vast and over stretched Empire; he was a god, waving a red sword over a map of the entire world. Yet, he was also a man among men, carrying the same limitations and burdens of those who served him. He was not all-powerful or all-seeing, but the people expected him to be. But, nature made Aurelius an emperor and so he believed it his calling to live up to his greatest potential. He did not lose himself in wine and women and become a victim of lust and desire, as many others had done, nor did he rule from fear and anxiety. The man had a beautiful soul. He could have had everything he wanted, he could have fulfilled his deepest passions and desires, yet he chose instead to pursue the end that was good for everyone.Power does not corrupt, power entertains the irrational and exposes the dirt within the soul. The wise man, the truly good man, Aurelius thought, is in control of his own soul. This is all that concerns him — to be at peace with his own spirit. He only fears making chaos of his soul for it is the only power that he has responsibility for. If he loses control, then he loses himself and is powerless to fulfill his obligation to nature. And, tranquility requires that one releases all that which he cannot control.But, how great of a challenge must this have been for an emperor! For Aurelius stood over a kingdom that faced continuous threats of invasion from all sides, even from within. Marcus Aurelius lived with a radical acceptance of nature. He moved through his days with no expectations; he never struggled against his fate nor did he resign himself in self-pity if the world betrayed him. No event should be mourned or celebrated. Because the victories of today may well be the cause of our demise tomorrow. Acceptance, only acceptance. And, with acceptance you will be able to find pleasure in each thunder and lightning that befalls you. Each event, in the eyes of a wise man, is a teacher, a lesson, a chance, a sign. Aurelius believed that life never ought to be different from what it is and so he was able to greet the future with joy and compassion. Life continues to unfold and we should rejoice in every page for it is our fate, the will of nature. Nature is unchangeable; we must not fight against it. Fighting against that which does not fall is foolish and will only leave us with a troubled spirit.Nothing outside of yourself should have power or friction over your peace. Leave that which you do not control in the hands of God or nature. But, for that which you do control — your soul, your emotions, your thoughts — learn to steer them in your favour. Because every man suffers a great deal in their life, but not all people pity themselves. There is a choice. Aurelius constantly reminded himself of this message in his journal so that he could practice its wisdom in his day-to-day life. And, in doing so, he freed himself from all that which could harm the peoples of his Empire — grief, fear,anger, and anxiety. For the peace of the Empire mirrored the peace of the emperor — he was the embodiment, the great incarnation of the kingdom.Because, in an autocracy, when the emperor falls sick, so must the Empire. I write at timeandritual.com and for my column on Medium.com. I hope you enjoy my essays and I especially hope they help you to think for yourself. Motivational Wisdom and Quotes from Marcus Aurelius’ Meditations.